The WHO estimates the average medication adherence rate is 50% in developed nations. Compared to the top 15 most adherent countries on Medisafe, the U.S. healthcare system ranks among the lowest. How do oncology drug adherence rates vary by day and time? Type of treatment? Oncology med class? Number of meds taken simultaneously? 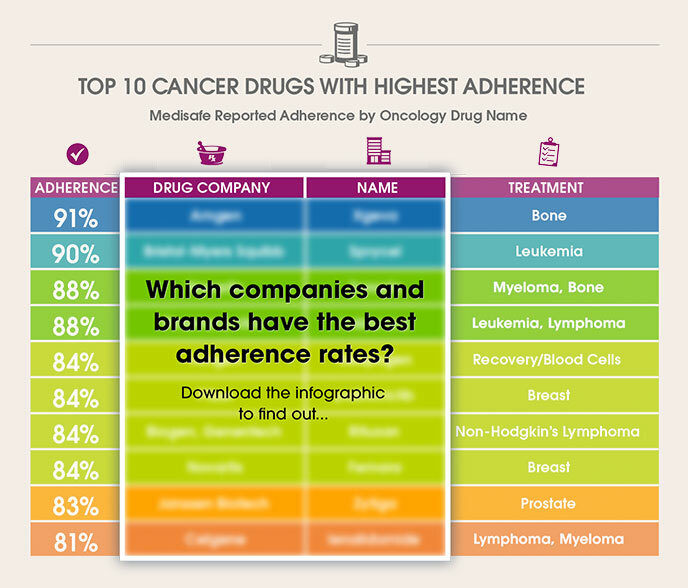 And which pharma companies manufacture the oncology drugs with the highest adherence rates on Medisafe? For example, we find Medisafe users with six or more prescribed meds not only have the highest adherence rates for multi-med oncology regimens, but they are 90% adherent to their medication regimens. Download this Infographic for comparative data and valuable insider insights.